“Now there were in the church that was at Antioch certain prophets and teachers; as Barnabas, and Simeon that was called Niger, and Lucius of Cyrene, and Manaen….and Saul. As they ministered to the Lord and fasted, the Holy Ghost said, Separate Me Barnabas and Saul for the work whereunto I have called them. And when they had fasted and prayed, and laid their hands on them, they sent them away. So they, being sent forth by the Holy Ghost, departed unto Seleucia.” Acts 13:1-4. We are met here to know the will of our God concerning His work, and to seek from Him the power for it. In the story of our text we shall find some precious thoughts to guide us as to what God would have of us, and what God would do for us. The great lesson of the verses I read is this: That the Holy Ghost is the director of the work of God upon the earth. And what we want to do if we are to work rightly for God, and if God is to bless our work, is to see that we stand in a right relation to the Holy Ghost, that we give Him every day the place of honour that belongs to Him, and that in all our work and, what is more, in all our private inner life, the Holy Ghost shall always have the first place. Let me point out to you some of the precious thoughts our passage suggests. 1. And, first of all, we see that God has His own plans with regard to His kingdom. His church at Antioch had been established. God had certain plans and intentions with regard to Asia, and with regard to Europe. He had conceived them; they were His, and He made them known to His servants. We talk about the winter campaign in the East End; but do we not all know that our great Commander organizes the campaign, and that His generals and officers do not always know the great plans? They often receive sealed orders, and they have to wait on Him for what He gives them as orders. God in heaven has planned for East London; we cannot doubt it. God in heaven has wishes, and a will, in regard to the work that ought to be done, and to the way in which it has to be done. Blessed is the man who gets into God’s secrets and works under God. Some years ago, at Wellington, where I live, we opened a Mission Institute what is counted there a fine large building. At our opening services the Principal said something that I have never forgotten. He remarked: “Last year we gathered here to lay the foundation stone, and what was there then to be seen? Nothing but rubbish, and stones, and bricks, and the ruins of an old building that had been pulled down. There we laid the foundation-stone, and very few knew what the building was that was to rise. No one knew it perfectly in every detail except one man, the architect. In his mind it was all clear, and as the contractor and the mason and the carpenter came to their work they took their orders from him, and the humblest labourer had to be obedient to orders, and the structure rose, and this beautiful building has been completed. And just so,” he added, “this building that we open today is but laying the foundation of a work of which only God knows what it is to become.” But God has His workers and His plans clearly mapped out, and our position is to wait, that God should communicate to us as much of His will as each time is needful. 2. Then the second thought. God is willing and able to reveal to His servants what His will is. Yes, blessed be God, communications come down from heaven still. As we read here what the Holy Ghost said, so still the Holy Ghost will speak to His Church and His people. In these later days He has often done it; He has come to individual men, and by His divine teaching He has led them out into fields of labour that others could not at first understand or approve; into ways and methods that did not recommend themselves to the majority. But the Holy Ghost does still in our time teach His people. Thank God, in our missionary societies and in our home missions, and in a thousand forms of work, the guiding of the Holy Ghost is known, but we are all ready, I think, to confess too little known. We have not learned enough to wait upon Him, and so we want to make our Convention a solemn declaration before God: O God, we want to wait more for Thee to show us Thy will. Do not ask God only for power. Many a Christian has his own plan of working, but God must send the power. The man works in his own will, and God must give the grace the one reason why God gives so little grace often an so little success. But let us all take our place before God and say: What is done in the will of God, the strength of God will not be withheld from it; what is done in the will of God must have the mighty blessing of God. And so let our first desire be to have the will of God revealed. If you ask me, Is it an easy thing to get these communications from heaven, and to understand them? I can give you the answer. It is easy to those who are in right fellowship with heaven, and who understand the art of waiting upon God. How often we ask, How can a person know the will of God? And people want, when they are in perplexity, to pray very earnestly that God should answer them at once. But God can only reveal His will to a heart that is humble and tender and empty. God can only reveal His will in perplexities and special difficulties to a heart that has learned to obey and honour Him loyally in little things and in daily life. 3. That brings me to the third thought. Note the disposition to which the Spirit reveals God’s will. What do we read here? There were a number of men ministering to the Lord and fasting, and the Holy Ghost came and spoke to them. Some people understand this passage very much as they would in reference to a missionary committee of our day. We see there is an open field, and we have had our missions in other fields, and we are going to get on to that field. We have virtually settled that, and we pray about it. But the position was a very different one in those former days. I doubt whether any of them thought of Europe, for later on even Paul himself essayed to go back into Asia, till the night vision called him by the will of God. Look at those men. God had done wonders; He had extended the Church to Antioch, and He had given rich and large blessing. Now, here are these men ministering to the Lord, serving Him with prayer and fasting. What a deep conviction they have it must all come direct from heaven. We are in fellowship with the risen Lord; we must have close union with him, and somehow He will let us know what He wants. And there they were, empty, ignorant, helpless, glad and joyful, but deeply humbled. O Lord, they seem to say, we are Thy servants, and in fasting and prayer we wait upon Thee. What is Thy will for us? Was it not the same with Peter? He was on the housetop, fasting and praying, and little did he think of the vision and the command to go to Caesarea. He was ignorant of what his work might be. May God grant that this may become our position in the time of our Convention; and as we look forward to our winter campaign, may we all realize that it is in hearts entirely surrendered to the Lord Jesus, in hearts separating themselves from the world, and even from ordinary religious exercises, and giving themselves up in intense prayer to look to their Lord it is in such hearts that the heavenly will of God will be made manifest. You know that word: “fasting” occurs a second time (in the third verse),“They fasted and prayed”. When you pray, you love to go into your closet, according to the command of Jesus, and shut the door. You shut out business and company and pleasure and anything that can distract, and you want to be alone with God. But in one shape even the material world follows you there. You must eat. These men wanted to shut themselves out from the influences of the material and the visible, and they fasted. What they ate was simply enough to supply the wants of nature, and in the intensity of their souls they thought to give expression to their letting go of everything on earth, in their fasting before God. Oh, may God give us that intensity of desire, that separation from everything, because we want to wait upon God, that the Holy Ghost may reveal to us God’s blessed will. 4. The fourth thought. What is now the will of God as the Holy Ghost reveals it? It is contained in one word: Separation unto the Holy Ghost. That is the keynote of the message from heaven. “Separate Me Barnabas and Saul for the work whereunto I have called them.” The work is Mine and I care for it, and I have chosen these men and called them, and I want you who represent the Church of Christ upon earth, to set them apart unto Me. Look at this heavenly message in its two fold aspect. The men were to be set apart to the Holy Ghost, and the Church was to do this separating work. The Holy Ghost could trust these men to do it in a right spirit. There they were abiding in fellowship with the heavenly, and the Holy Ghost could say to them. Do you the work of separating these men. And these were the men the Holy Ghost had prepared, and He could say of them, Let them be separated unto Me. Here we come to the very root, to the very life of our need as workers. The question is amongst us, What is needed that the power of God should rest upon us more mightily, that the blessing of God should be poured out more abundantly among those poor wretched people and perishing sinners among whom we labour? And the answer from heaven is, I want men separated unto the Holy Ghost. What does that imply? You know that there are two spirits on earth. Christ said, when He spoke about the Holy Spirit, “The world cannot receive Him.” Paul said, “We have received not the spirit of the world, but the Spirit that is of God.” That is the great want in every worker the spirit of the world going out, and the Spirit of God coming in to take possession of the inner life, and of the whole being. I am sure there are workers who often cry to God for the Holy Spirit to come upon them as a Spirit of power for their work, and when they feel that measure of power, and get blessing, they thank God for it. But God wants something more and something higher. God wants us to seek for the Holy Spirit as a Spirit of power in our own heart and life, to conquer self and cast out sin, and work the blessed and beautiful image of Jesus into us. There is a difference between the power of the Spirit as a gift, and the power of the Spirit for the grace of a holy life. A man may often have a measure of the power of the Spirit, but if there be not a large measure of the Spirit as the Spirit of grace and of holiness, the defect will be manifest in his work. He may be made the means of conversion, but he never will help people on to a higher standard of spiritual life, and when he passes away a great deal of his work may pass away too. But a man who is separated unto the Holy Ghost is a man who is given up to say: Father, let the Holy Ghost have full dominion over me, in my home, in my temper, in every word of my tongue, in every thought of my heart, in every feeling towards my fellowmen; let the Holy Spirit have entire possession. Is that what has been the longing and the covenant of your heart with your God to be a man or a woman separated and given up unto the Holy Ghost? I pray you listen to the voice of heaven. “Separate Me”, said the Holy Ghost. Yes, separated unto the Holy Ghost. May God grant that the Word may enter into the very depths of our being to search us, and if we discover that we have not come out from the world entirely, if God discovers to us that the self-life, self-will, self-exaltation are there, let us humble ourselves before Him. We have announced that these are to be days of humiliation; and when once we are fairly started in our work we want to take time to humble ourselves before God, and to ask God Himself to humble us under His mighty hand. Man, woman, brother, sister, you are a worker separated unto the Holy Ghost. Is that true? Has that been your longing desire? Has that been your surrender? Has that been what you have expected through faith in the power of our risen and almighty Lord Jesus? If not, here is the call of faith, and here is the key of blessing separated unto the Holy Ghost, God write the word in our hearts! I said the Holy Spirit spoke to that church as a church capable of doing that work. The Holy Spirit trusted them. God grant that our churches, our missionary societies, and our workers’ unions, that all our directors and councils and committees may be men and women who are fit for the work of separating workers unto the Holy Spirit. 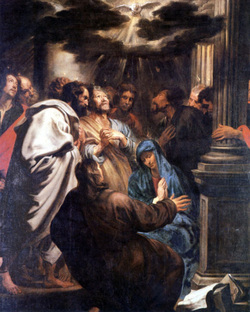 We can ask God for that too, and I trust God may lead us so that before we part tomorrow evening we may, all who desire it, ask that as a company we should separate each other unto the Holy Spirit, that each one should separate himself unto the Holy Spirit, and ask his brothers and sisters to join with him in prayer to that end. May God make us worthy of doing the work for each other. 5. Then comes my fifth thought, and it is this: This holy partnership with the Holy Spirit in His work becomes a matter of consciousness and of action. These men, what did they do? They set apart Paul and Barnabas, and then it is written of the two that they, being sent forth by the Holy Ghost, went down to Seleucia. Oh, what fellowship! The Holy Spirit in heaven doing part of the work, man on earth doing the other part. After the ordination of the man upon earth, it is written in God’s inspired Word that they were sent forth by the Holy Ghost. And see how this partnership calls to new prayer and fasting. They had for a certain time been ministering to the Lord and fasting, perhaps days; and the Holy Spirit speaks, and they have got to do the work and to enter into partnership, and at once they come together for more prayer and fasting. That is the spirit in which they obey the command of their Lord. And that teaches us that it is not only in the beginning of our Christian work, but all along, that we need to have our strength in prayer. If there is one thought with regard to the church of Christ, which at times comes to me with overwhelming sorrow; if there is one thought in regard to my own life, of which I am ashamed; if there is one thought of which I feel that the Church of Chrit has not accepted it and not grasped it; if there is one thought which makes me pray to God, Oh, teach us, by Thy grace, new things it is the wonderful power that prayer is meant to have in the kingdom. the dungeon of London and of heathendom. But, oh, we are far more occupied with our work than we are in prayer. We believe more in speaking to men than we believe in speaking to God. Learn from these men that the work which the Holy Ghost commands must call us to new fasting and prayer, to new separation from the spirit and the pleasures of the world, to new consecration to God and to His fellowship. Those men gave themselves up to fasting and prayer, and if in all our ordinary Christian work there were more prayer there would be more blessing in our own inner life. If we felt and prove and testified to the world, My only strength is in keeping every minute in contact with Christ, every minute allowing God to work in me if that were our spirit, would not, by the grace of God, our lives be holier? Would not they be more abundantly fruitful? I hardly know a more solemn warning in God’s Word than that which we find in Galatians 3, where Paul asked, “Having begun in the Spirit, are ye now made perfect by the flesh?” Do you understand what that means? A terrible danger in Christian work, just as in a christian life that is begun with much prayer, begun in the Holy Spirit, is that it may gradually shunted off on to the lines of the flesh; and the word comes, “Having begun in the Spirit, are ye now made perfect by the flesh?” In the time of our first perplexity and helplessness we prayed much to God, and God answered and God blessed, and our organization became perfected, and our band of workers became large; but gradually the organization and the work and the rush have so got possession of us that the power of the Spirit, in which we began when we were a small company, has almost got lost. Oh, I pray you, note it well! It was with new prayer and fasting, with more prayer and fasting, that this company of disciples carried out the command of the Holy Ghost. “My soul, wait thou only upon God.”That is our highest and most important work. The Holy Spirit comes in answer to believing prayer. You know when the exalted Jesus had ascended to the throne, for ten days the footstool of the throne was the place where His waiting disciples cried to Him. And that is the law of the kingdom the King upon the throne, the servants upon the footstool. May God find us there unceasingly. Then comes the last thought. What a wonderful blessing comes when the Holy Ghost is allowed to lead and to direct the work, and when it is carried on in obedience to Him! You know the story of the mission on which Barnabas and Saul were sent out. You know what power there was with them. The Holy Ghost sent them, and they went on from place to place with large blessing. The Holy Ghost was their leader further on. You recollect how it was by the Spirit that Paul was hindered from going again into Asia, and was led away over to Europe. Oh, the blessing that tested upon that little company of men, and upon their ministry unto the Lord! I pray you, let us learn to believe that God has a blessing for us. The Holy Ghost, into whose hands God has put the work, has been called “the executive of the Holy Trinity." The Holy Ghost has not only power, but He has the Spirit of love. He is brooding over this dark world, and brooding over this East London, and every sphere of work within it, and He is willing to bless. And why is there not more blessing? There can be but one answer. We have not honoured the Holy Ghost as we should have done. Is there one who can lift up his hand and say, That is not true? Is not every thoughtful heart ready to cry, God forgive me that I have not honoured the Holy Spirit as I should have done, that I have grieved Him, that I have allowed self and the flesh and my own will to work where the Holy Ghost should have been honoured? May God forgive me that I have allowed self and the flesh and the will actually to have the place that God wanted the Holy Ghost to get. Oh, the sin is greater than we know! No wonder that there is so much feebleness and failure in the Church of Christ!